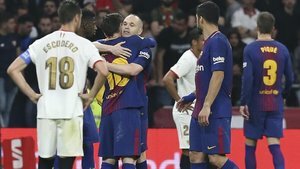 Barça will take on Sevilla in the quarter finals of the Copa del Rey. The first leg will be played at the Sanchez Pizjuan next week, presumably on the 23rd January, with the return leg at the Camp Nou likely to be on the 30th January. This fixture is a re-run of last season's final as well as the 2016 one, both of which were won by the Catalan side. In fact Barça have won the last four Copa del Reys and are looking to win their fifth title. It would see them make even more history as no one side has managed to win the competition five times in a row.